Many people would live differently if they realized that their lives will one day be judged on the ordeal. God's court is such an important event that it should address all media throughout the world. People involved in the place of the less important things. God's court will render to every man according to his choice. Faith in Jesus Christ receive the Holy Spirit and His law into your heart and it is the only way to stand before God's court. (More - in the article only way to heaven.) Devote the time to Jesus Christ and God's word, not pleasure, or concern for a better life. God's trial also ended a great struggle between good and evil, between God, who through love and Satan, who rebelled against God and his laws, and showed with evil. God reveals in the court of Satan's false freedom, the extent and consequences of his rebellion. It shows that the conditions and laws that God has a happy life created by beings are good and satisfactory. Therefore, the law of God as the standard in court, and later in the eternal life! 1st part of the court of the faithful people who carried out according to the prophecies of Daniel chapter 7 in 1844 (more - in the article creation adventismu) and will be completed before the second coming of Jesus Christ. 2nd of the court will be based on the book of Revelation chapter 20 Jan during the millennial kingdom, when God opens the books in heaven and earth will still desolate and empty. 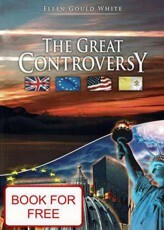 During the millennium will be faithful to Christ in heaven, and will face trial in the second phase of the unbelievers. The unbelievers are dead, and Satan will wander far for a thousand years of desert land, it will be his prison. After a thousand years, Satan will be released and the wicked people will be resurrected. God will come with the redeemed of God of Jerusalem, and by a court of wicked men, Satan, and cleanse the earth with fire and then it resumes. This approach has its own logic. Before Christ comes, it must be clear who the group to which humans belong. The first trial is designed to allocate and justify the salvation of men, and show that it is possible to be saved through faith in Jesus Christ. Jesus Christ here takes the role of advocate, advocate. The first phase of the trial is now - at a time when the people of the Gospel preached, and everyone can learn about the trial and the second coming of Jesus Christ. But it is a temporary opportunity. When Christ ceases high priest service, God closes the last case, and Christ will come again. Religious people - alive and dead will be resurrected, transformed, and leave together with Christ in heaven. But we will begin the end of 1000 years, during which the country will be empty, because the wicked will not last to see Jesus Christ and perish. In heaven, the 2nd phase of the trial other people and Satan. Then Jesus will come again and will render all. Cleanse the earth by fire from all sin and creating new ones. Let's see what the court of God in the Bible. Ecclesiastes 12.14 - God will judge everything that is happening, and is hidden, whether it be good or bad. Jude 1:14-15 - In the seventh generation from Adam, Enoch, prophesied about them, saying: "Behold, the Lord comes with countless thousands of his saints, to judge all people and each convicted of all their ungodly deeds which ungodly committed, and because of all the harsh words ungodly sinners who you talked to him. " Ecclesiastes 11.9 - Rejoice, young man, from his youth, from the heart glad, while you're young. Go where you keep your own heart for what you see with your eyes. Be aware, however, that with all this before you become God's court. Romans 2,3 - Do you think, man, that God escape court when you judge others, but myself doing the same? Matthew 12,36-37 - but I'm telling you, That every idle word that men shall speak, they shall give account on Judgement Day. In his own words thou shalt be justified, in their own words thou shalt be condemned. " John 14.3 - I go to prepare a place for you. When I go and prepare a place for you, I will come again and take you to myself, you also may be where I am. Do you know where to go, and you know the way. " People will be judged for their actions, words and thoughts. God's court will be absolutely objective and fair, and people will be judged according to God's unchanging law. Psalm 7.18 - the Lord for his righteousness will praise the name of the LORD will play - he is Supreme! Jeremiah 9.24 - "Behold, the days come, saith the LORD, which cleared all those who are circumcised in the flesh - Egypt, Judah, Edom, the Ammonites, Moab and all the desert dwellers who have the utmost corners. All these nations are uncircumcised, and all because the house of Israel is uncircumcised in heart. " 2,11-12 James - The same who said: "Necizolož," also said: "Do not kill." So if not commit adultery, but the killing, a transgressor of the law. God's definitive and irrevocable court decision about the eternal destiny of people. Either there are to be justified by faith in Jesus Christ and receive eternal life, and no intercessor will be condemned to eternal perdition. Romans 2,2-9 - He "will render to each according to his deeds" - those who persistently and doing good seek glory, honor and immortality, eternal life, those who in his selfishness, the truth and refuse to follow the wrongdoing, however, reward fierce anger. Tribulation and distress awaits the soul of every man who does evil, Jew first and also to the Greek. Anyone who does good, the Jew first and also to the Greek, then waits for glory, honor and peace. God has partiality to anyone. God's court will end the great cosmic struggle between good and evil. Satan and sin will be ended once and for all and sentenced. Revelation 20, 10-15 - The devil, who deceived them was cast into the lake of fire and brimstone where the beast and false prophet, that they will be tormented day and night for ever and ever. Then I saw a great white throne and Him who sat upon it, from whose face the earth and sky had disappeared and could not find a place for them. Then I saw the dead, small and great, standing before the throne, and books were opened. And it was open yet another book, namely the book of life, and the dead were judged according to what was written in the books, according to their deeds. At sea gave up the dead who were in it, also issued death and hades those dead in them, and each was judged by his deeds. Death and hades were cast into the lake of fire - this is the second death. Anyone not found written in the book of life was cast into the lake of fire. God would justify the court of God, cleanse his name disgraced before the whole universe reveals His love for lost man. Isaiah 5.16 - but the Lord of hosts is exalted by the court, Holy Holy God shows up in righteousness. Revelation 15, 2-4 - though I saw a sea of glass mingled with fire, and also those who are victorious over the beast, over his image and the number of his name. They stood on the sea glass, God had a lute and sang the song of Moses the servant of God and the song of the Lamb: "Great and trans strange are your deeds, Lord God Almighty, just and true are thy ways, O King of nations! Who would not honor you, O Lord, to praise thy name? For you alone are holy! All nations will come and bow down before thee, for thy righteous acts have been revealed! " The first part of God's apostle Peter states the court will be judged by people of faith, even at a time when preaching the gospel. 1 Peter 4.17 - the court's time and the first number is the house of God. If what happens to us, just the beginning, the end of what awaits those who reject the gospel of God? Matthew 25,31-33 - "When the Son of Man comes in his glory with all his angels, he will sit on the throne of his glory. All nations will be gathered before him, and he is separated from one another as a shepherd separates the sheep from the goats. Sheep on his right hand, but the goats on his left. Revelation 14,6-7 - I saw another angel flying in the center of heaven, having the everlasting gospel to preach to the inhabitants of earth - to every nation, tribe, tongue, and people - saying with a loud voice: "Fear God and give his praise is come the hour of his trial. Worship Him who made heaven and earth, the sea and springs of water! " 1 Thessalonians 4,15-18 - We have word from the Lord: We who live to see the coming of the Lord, not precede those who have fallen asleep. You hear the rousing command, the voice of the archangel and the trump of God, the Lord Himself will descend from heaven and the first time the dead in Christ shall rise. We live together with them caught in the clouds to meet the Lord, then we'll be with the Lord forever. Encourage each other with these words. The second part of God's court, said most of Revelation of John, Chapter 20. God's people in heaven with Christ will judge the world. 1 Corinthians 6,2-3 - Did you know that the saints will judge the world? When you have one to judge the world, you're not able to judge such trifles? Do you know that we will judge angels? The rather ordinary affairs of life! Revelation of John 20,4-7 - I saw thrones, and those who sat on them, and were entrusted to the court. I saw the souls of those executed on the testimony of Jesus and the word of God, the souls of those who had not worshiped the beast or his image and had not received its mark on the forehead or hand. They lived and reigned with Christ a thousand years. Other dead not alive however, until the thousand years. This is the first resurrection. Blessed and holy is he who has part in the first resurrection. Over such the second death has no power, but they will be priests of God and Christ and will reign with Him a thousand years. When the thousand years expire, Satan will be released from jail. Millennium - millennial kingdom, when the country will be bleak and empty, and Satan will be here in prison. The Bible says in Genesis that the earth was at the beginning of dishonor and void and darkness was over the abyss. The Greek word used here - abussos - is the same as the word John in Revelation 20, 1, which speaks of the millennium. Revelation 20,1-4 - Then I saw an angel descending from heaven in his hand the key of the bottomless pit and a great chain. He seized the dragon, that ancient serpent, who is the devil and Satan, and bound him a thousand years. Threw him into the abyss and locked and sealed it over him, that he should deceive the nations until the thousand years were fulfilled, then were to be briefly released. I saw thrones, and those who sat on them, and were entrusted to the court. Isaiah 13.9 - Behold, the day the Lord comes with a relentless and fierce anger, eager to make the country completely devastated and destroyed it from the sinners. Jeremiah 4,23-28 - I saw the earth - behold, desolate and empty, I looked up to heaven - I had no lights. I saw mountains - all shook up, shook all the hills. I saw and behold - nowhere man all the birds disappeared. I've seen - and lo, the fruitful became deserts, and all the cities fell before the LORD, when his anger was kindled! Thus saith the Lord: "The remaining ruins the whole country, even if I destroy it completely. And so the country will mourn the sky above in the darkness enveloped, as I said, does not take back what I've decided it will not change. " Earth will be destroyed by fire and then restored. 2nd Peter 3,7 - The same word keeps and maintains the current heaven and earth to fire, which is awaiting the Day of Judgement and perdition of ungodly men. Revelation of John 21.1 - Then I saw a new heaven and new earth. For the first heaven and the first earth had passed away and the sea no longer. Revelation 22, 12-13 - "Behold, I come quickly and my reward is with me, to give every man according to his deeds. I am the Alpha and the Omega, the beginning and end of the first and last. " AmazingHope.net - Approaching the court of God - get ready!